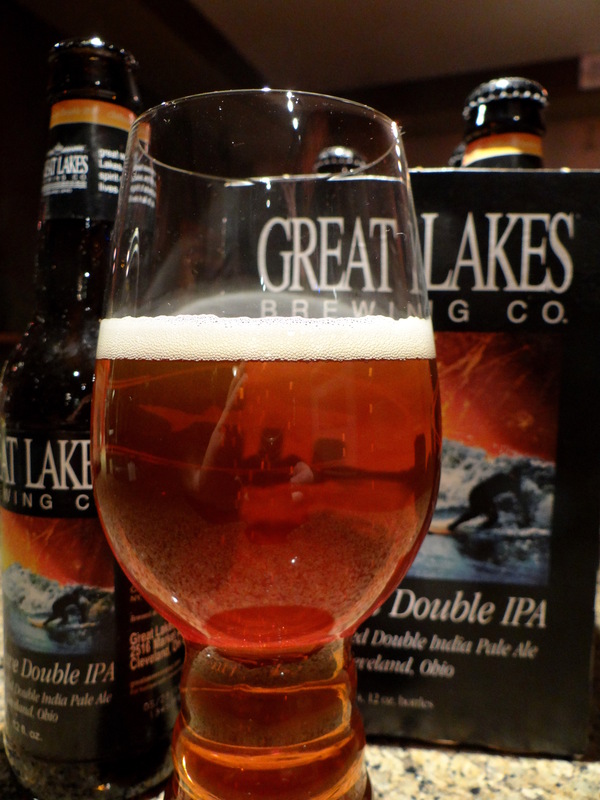 In this review I’m going to compare two of my favorite hop-forward late winter releases: Nugget Nectar by Tröegs in Hershey, PA and Chillwave by Great Lakes out of Cleveland, OH. Since Nugget Nectar is an Imperial Amber Ale while Chillwave is an Imperial IPA this comparison may seem somewhat artificial, but these two beers have some important things in common and I would argue that the comparison is instructive, particularly when it comes to teasing out how different hops contribute to the overall aroma and taste of each beer. Since both Tröegs and Great Lakes are great about providing great detail on the ingredients that go into their beers we can start by looking at the vital statistics of each beer. What the Brewer has to say: Squeeze those hops for all they’re worth and prepare to pucker up! Nugget Nectar Ale will take hopheads to nirvana with a heady collection of Nugget, Warrior and Tomahawk hops. Starting with the same base ingredients as our flagship HopBack Amber Ale, Nugget Nectar intensifies the malt and hop flavors to create an explosive hop experience. What the Brewer has to say: (Several sentences about Lake Erie surfers which I will skip for the sake of brevity). With a flash of Mosaic hops and a kiss of honey malt, it’s a rush in a bottle. Ride our Chillwave. Then go out and find your own. …. The taste is hop-forward with a balanced blend of Mosaic and Nugget hops. These two beers are relatively similar in terms of abv (7.5% vs. 8.6%), ibu (93 vs 80), and price ($2.17 vs. $2.50 per bottle). Both are clear with a deep amber color, and both feature Nugget hops prominently. The thing that I love most about each of these beers is the delicious fruity aroma and taste. (Here I mean fruity due the aromas and tastes that come naturally from the hops.) The fruity character of both beers is distinctly different from the grapefruit-like citrus flavors that you get with the most west coast IPAs, or the mango and wine-like flavors that you get from beers containing New Zealand hops (e.g. Nelson Sauvin). The word juicy came up in my reviews of both beers, because the waves of fruity goodness are accompanied by a subtle nectar-like sweetness rather than the more conventional dry, piney bitterness. That’s not to say that these beers are not bitter, but given the high IBU levels the bitterness is pretty smooth/restrained in both beers. Nugget Nectar has a more substantial malt canvas on which the hops come to life. There is a little caramel from the Vienna and Munich malts that compliments the hops nicely. The fruity aromas and flavors of Nugget Nectar are hard to describe exactly but they bring to mind oranges, tangerines and peaches. There is just a hint of pine on the finish. Chillwave has similar orange/tangerine/peach notes, but they are accompanied by a healthy dose of funky hop flavor/aroma that brings to mind descriptors like tropical fruit and dank. After reading about the Mosaic hops used in Chillwave I can swear there are hints of blueberries in the hop funkiness (although I would have never found the taste without the power of suggestion). Chillwave leaves a slightly sweet lingering taste in your mouth that is just a shade sweeter than I would like. I’d give Nugget Nectar higher marks for drinkability. If you are looking for a supremely well balanced, fruity, hop forward beer it’s hard to top Nugget Nectar. If you are looking for a bold celebration of unconventional hop fruitiness, Chillwave is the beer for you. It pushes the unconventional hop flavors and aromas up to the edge without going over the precipice (at least for my taste buds). I think it is the best Imperial IPA out there. On a 1-10 scale I would give Nugget Nectar a rating of 8 and Chillwave a 9.5. If you just want to know what these beers taste like you can stop here. If you are interested in how the brewers use different hops to get these unconventional flavors in both beers keep reading. “Nugget Hops was released in 1982 by the USDA and is a cross between Brewers Gold and a high alpha acid male. Nugget Hops is the mother of Millenium Hops and by 1991 had taken over 14.1% of U.S. hop production. Before going on let’s take a moment to elaborate on some important terms in this description that may not be familiar to some readers, like alpha acid, co-humulone and myrcene. Humulones are a class of organic molecules that are known as alpha-acids and give beer its characteristic bitter flavor. Any hoppy beer made with substantial amounts of American hops is going to be relatively high in alpha-acids. Alpha-acids can be further subdivided into humolones, co-humulones and ad-humulones. The low co-humulone description of Nugget is pertinent, because conventional wisdom is that beers with low levels of co-humulone have a “smooth” bitterness, while those with high levels of co-humulone have more of a “harsh” bitterness. Myrcene is a volatile hydrocarbon (an alkene, 7-methyl-3-methylene-1,6-octadiene for the chemists out there) that is associated with green, resinous aroma/flavor. Other plants that have high levels of myrcene include thyme and cannabis. Myrcene is responsible for much of fresh picked green hop aroma of fresh hopped beers. So beers that prominently feature Nugget hops should have a smooth bitterness and some green, resinous woody notes. For both Nugget Nectar and Chillwave the “smooth bitterness” descriptor seems right on the mark, while the green/resinous aroma does not jump out at me. Nobody seems to mention the orange/tangerine/peach flavors that I am picking up, so it seems like they are coming from the other hop varieties. Let’s take a look at brief descriptions of the other hops used in Nugget Nectar (descriptions are amalgams taken from “For the Love of Hops” and the Beer Legends website). Warrior – A strong bittering variety with a relatively low co-humulone oil content, known for its mild aroma. Tomahawk – Essentially the same hop as Columbus, and very similar to Zeus (sometimes these are referred to as CTZ hops). A high alpha acid variety that adds bitterness and an herbal, earthy aroma. Simcoe – Also a high alpha acid variety that can add bitterness, but Simcoe differs from its northwest hop cousins in some significant ways. Its co-humulone oil content is among the lowest of any hop, and its myrcene oil content is among the highest. Intense aroma, rich in multiple citrus fruits, black currant, berries and pine. Beers that feature Simcoe prominently are sometimes perceived as “catty”. Palisade – Lower levels of alpha acids and bitterness than the other hops described here. Used primarily for its floral and fruity aroma, it is associated with sweet nectar fruits. None of the hop descriptions seems to mention the orange/tangerine/peach flavors that I am picking up, but the aromas of both Simcoe and Palisade are associated with the non-standard fruity goodness that I get from Nugget Nectar. However, both Warrior and Simcoe have low co-humulone oil content further reinforcing the “smooth bitterness” aspect of Nugget Nectar. Also notable is the lack Cascade or Centennial hops, both of which are closely associated with the grapefruit flavors, and Chinook hops, that bring a piney, resinous aroma. The bottom line is that while Nugget gets top billing, the other hop varieties probably play an important role in giving Nugget Nectar its orange/tangerine/peach character. These descriptions are more or less consistent with the tropical fruit character that I was having a hard time putting into words earlier in the review. I will also add that Mosaic is another low co-humulone hop, hence the smooth bitterness of Chillwave is comparable to Nugget Nectar. Since Mosaic’s father is Nugget I wonder if that makes Chillwave’s Mosaic/Nugget blend a borderline incestuous beer? 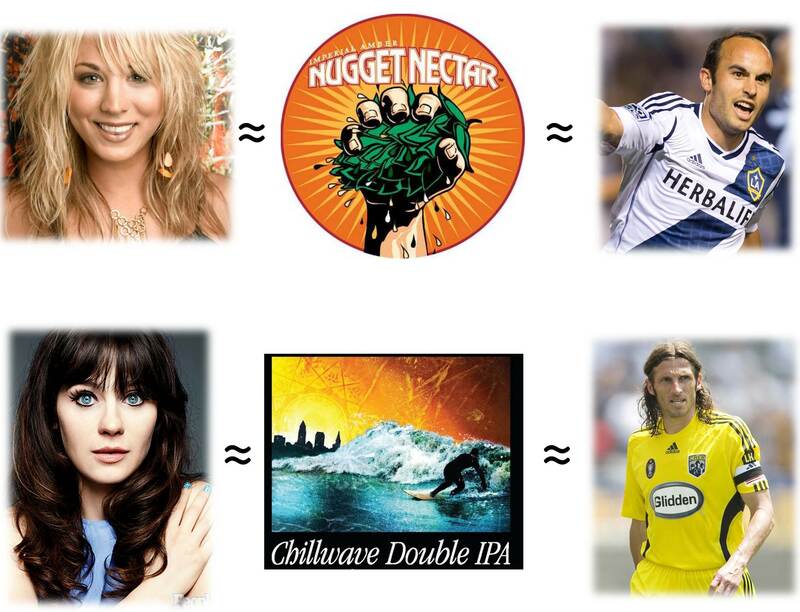 Both Chillwave and Nugget Nectar are great beers in my book. 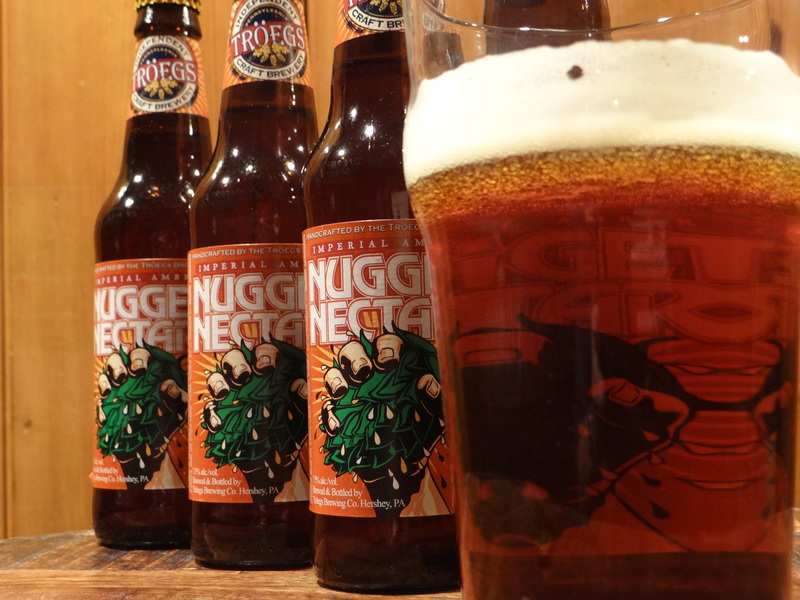 Nugget Nectar shines in a more conventional sense, sort of like the Miss America of hoppy beers. If you are looking for something that pushes the boundaries Chillwave is definitely worth seeking out. Although my better judgment says it is a bad idea I’m going to compare these two beers to celebrities. Nugget Nectar is your conventional beauty, say Kaley Cuoco, while Chillwave has an edgier, unconventional appeal like Zoey Deschanel. If you prefer a sports analogy, Nugget Nectar is skilled and reliable like Landon Donovan while Chillwave is in your face and unpredictable, but capable of brilliance, like Frankie Hejduk. I’m sure there’s a better analogy out there, so feel free to make your own comparison in the comments section. If you haven’t yet tried these gems of late winter you better pick some up soon, because stocks won’t last much longer. I predict that Mosaic is destined to join Citra and Simcoe and as one of the new “it” hops. For the home brewers out there I’d love to hear your thoughts on the connections between the ingredients and the aroma/flavor of these two beers. Blueberries? I will look for it next time. The Chillwave has an unusual “mouthfeel” compared to other IPAs. You note a sweetness in your review, and that is part of it, but it is also a little fuller, something else going on. Perhaps this is related to the surfer-mentality of those near Lake Erie (which you dismiss for some reason…). This quality makes it really easy to identify, even when compared with other citrus-forward IPAs. I also find that Chillwave, at least on the nose, has hints of melon or apricot, whereas other IPAs (like White Rajah) have more grapefruit-forward qualities joined with its orange/tangerine. Looking forward to where you place White Rajah in this triumvirate of IPAs, and how you personify it. I can agree with your description of melon/apricot notes in Chillwave. Do you pick up anything that resembles blueberries?